This is a guest post by Dan Hestbaek – Co-founder and CEO of Hestbæk Consult, the leading Marketing Management Consultancy in the Nordic region. To which the answer is complex and never the same, as the level of involvement with agencies as well as the industry, in which you are operating in, is a decisive factor when determining switching costs. To provide the audience with knowledge in this field, our second viewpoint is based on this topic, ultimately illuminating challenges for both clients and agencies. Our knowledge is primarily based on experience from various agency searches, in which considerations to agency switching costs are highly important. What are agency switching costs? When considering replacing your agency, the role of switching costs becomes relevant. We categorize these switching costs as the money, time and effort used in building a new relationship, as well as the costs of exiting a relationship. Clients incur set-up costs and exit costs respectively. Set-up costs in advertising occur because clients need to guide and direct their agency representatives to ensure that agency knowledge, skills and expertise are transformed into client value. Exit costs are apparent when that value is lost by later switching agency. The exit cost can be lost opportunities with the former agency or a potential leak of proprietary client knowledge involving sensitive commercial data of value for competitors. It should be noted that the industry in which one is operating also plays a significant role in connection to measuring switching costs. As for instance industries that require a high degree of technical product knowledge, often seen in durables, has higher switching cost associated with changing agency. This ultimately means that agencies operating with these types of clients often enjoy longer relationships. When looking into some of the aforementioned switching costs, the level of commitment between client and agency becomes important to analyze, as this level will determine how high the cost of replacing an agency will be. It can therefore be helpful to determine where in a relationship life cycle the relationship between agency and client is placed. The time spent on building the relationship will indicate whether the relationship is in the initial phase, the transitional phase or if it has moved to a mature stage, in which the switching costs are the most expensive. 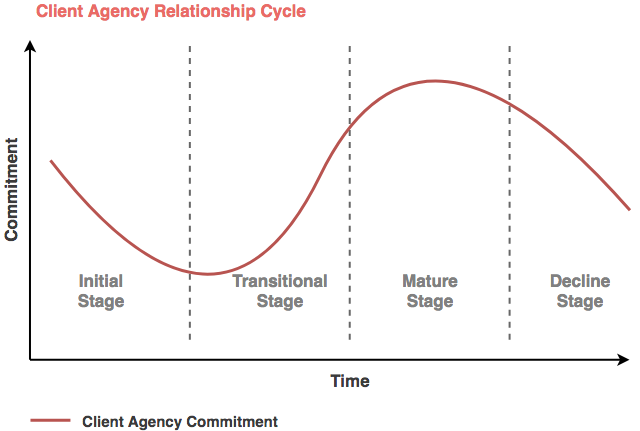 Below, the relationship cycle between agency and client is illustrated. 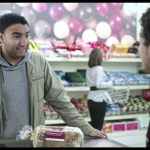 When is the optimum time to switch agency from a cost perspective? What we have experienced is that replacing an agency due to challenges, which may seem critical, is not always the right solution for clients, at least from an economical perspective. Complications between client and agency can sometimes be solved by conducting formal periodic evaluations of the relationship combined with informal evaluations, workshops and social events when relevant. This can create improved trust and understanding both ways and illuminate challenging areas of the relationship. If efforts made to improve the relationship do not work or if the desired competencies are not present at the agency, the timing for changing your agency can affect the switching costs to be lower. High switching costs are often connected to relationships that are at the initial phase, in which a lot of investment has been made to set up the new collaboration. However, the level of trust between both parties is still low and the switching costs are therefore not at the highest level. The highest switching costs occur at the mature relationship level. At this level a lot of relationship investment is made, formal evaluations are used to track and improve conflicts and the agency is often considered to be a strategic partner. All of which creates a solid client agency relationship, thus indicating the highest switching cost. Between these two stages as mentioned above (initial and mature) is the transitional stage, in which the switching costs are the lowest. At this stage the high set up costs from the initial stage have decreased, the trust is growing, however not at the level of full trust. This is illustrated in the curve below, indicating total switching costs. 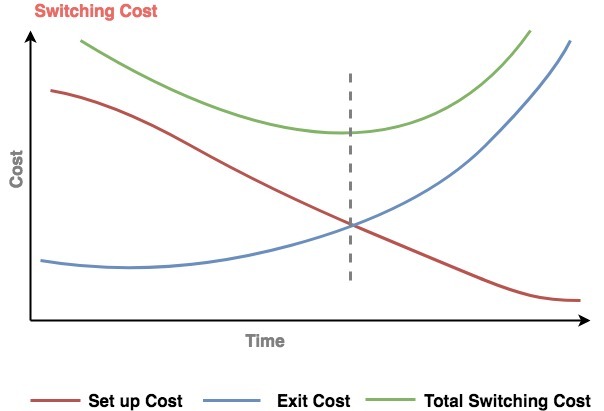 The model illustrates where costs are highest and lowest, which could ultimately be helpful in determining when to replace an agency from a cost perspective, aiming at switching agency when the curve of total switching costs is at its lowest. Measuring the costs associated with switching an agency is a comprehensive task, which requires a clear understanding and intelligence on the resources, used on the agency. This is in regards to briefings, workshops, evaluations etc., which can somehow be measured with the time spent and the money used on these activities. However, it is more difficult to measure the intangible costs such as emotional and psychological elements. Moreover, these elements vary from each individual and can be looked at as crucial and priceless for some individuals, while others may not rank trust and emotions very high. Nonetheless, many costs that may not seem that evident occur when replacing an agency, thus it becomes crucial that one does not make an adverse selection. Adverse selection means choosing a wrong agency for the task, which could be caused by agencies overstating their talent or over-promising their deliverables. This scenario could lead to an expensive initial phase with extra high startup costs and a possibility of an early break up. To minimize the initial switching costs we strongly believe that money and time could be saved in the agency search phase by conducting a structured and insights driven agency search process; handled either internally or externally by agency search consultants. 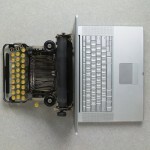 How is your existing contractual setup with your agency? Have you have considered your resources for conducting an agency search process both internally and externally? When conducting formal client agency evaluations make sure to structure follow-up action points that can be measured upon – both on client side and agency side. What are your experiences with agency switching and the costs attached? Leave a comment with your thoughts.